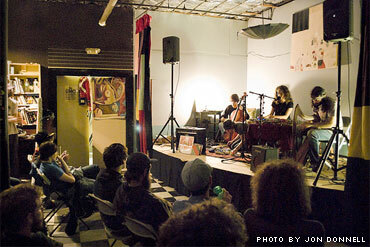 Last night marked the debut of a new venue in Portland. The Apohadion is a brand-new performance space located at 107 Hanover Street, in the space otherwise known at Fort Awesome, Pat Corrigan and Dave Noyes’ studio. Jon Donnell was there and got some great shots of the new space and the three bands that christened it: Tempera, Wolf Larsen (which we got a bit of a preview of last Friday), and Gay Camp (feat. members of Planets Around The Sun/Cursillistas/White Light, Visitations/A.M. Frank, and The Orchards). Check out all of Jon’s photos from this show here. So just what is the Apohadion? Well, Portland’s only subterranean theater, of course! For an introduction, check out Pat Corrigan’s comics from The Bollard: June 1, 2007 sheds some light on the back story, and the December 6th comic revisits the name, but just piles some mystery on top. I can’t wait to see the venue myself and find out what they have coming up. Ah, this was the other show Gay Camp was playing. I ran into them sunday and they mentioned a show at prime which I, and about 20+ other people showed up for and which they subsequently bailed on. Bummer.